CHARLES BLACKMAN (1928 - 2018). Limited Edition Print - Archival Pigments on Artist Paper / Card. Signed: Lower Right Edition: Edition of Only 125 (Editioned - Lower Left) Image Size: 66cm x 77cm. Sheet Size: 77cm x 87cm. Art Condition: Excellent - New. Markings: Embossed Seal - Lower Left. You can also come view this work and many others in our Surry Hills Gallery in Sydney. Please message me to arrange a time to view in person. ABN 36 561 407 649. 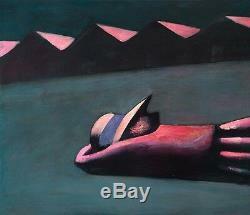 Charles Blackman was quite simply one of the most highly regarded figurative artists in Australia. In a career spanning more than 60 years, Blackman has gained a local and international reputation as a mainstay in post-War Australian art. Probably best known for his. Series, he was also a member of the Antipodeans group, and a contemporary of Sidney Nolan, Arthur Boyd and Albert Tucker amongst others. Born in Sydney in 1928, Blackmans career in visual art began as a young illustrator with the Sydney. He developed his skills with night classes in drawing and design, and gained recognition for his art after moving to Melbourne in the late 1940s. Blackman exhibited with the revived Contemporary Art Society in 1953, and was also one of the original signatories of the Antipodean Manifesto. The Antipodeans reacted to the rise of abstract expressionism, fearing that American abstraction in particular was becoming the dominant style of international art. The groups defence of modernist and figurative art lead to major exhibitions for Blackman in London in 1960 and later in Paris. His most familiar work, the. Series reflect his facility for dream-like imagery and a melancholy sense of foreboding. His work includes portraits, landscapes and studies using a range of fine media. His work was included in the Whitechapel Open Exhibition in 1961 and Tate Gallery exhibitions of Australian Art 1962-63. Was organised in 1993 by the National Gallery of Victoria. His work is held in all Australian states and many regional galleries. Blackman has won many prizes including the Rowney Prize for drawing (1959) and the Helena Rubinstein Scholarship (1960). He was awarded an OBE in 1997 for services to Australian art. The item "CHARLES BLACKMAN Prone Schoolgirl Signed, Limited Edition Print 66cm x 77cm" is in sale since Tuesday, September 2, 2014. This item is in the category "Art\Art Prints". The seller is "martinezartdealer" and is located in Surry Hills, New South Wales. This item can be shipped worldwide.